At the age of one Kate won a painting contest at the county fair and she hasn't looked back since (that award winning painting hangs in her studio). Originally from Tennessee, Kate lives in Chicago with her husband and four children. She taught and wrote curricula about masterpieces at The Art Institute of Chicago for many years before making the move to set up a studio practice at home while raising her children. Kate’s paintings are in private collections around the world. Her first illustrated book with Chronicle Books will be available fall 2020. Kate has a BA in painting from Presbyterian College in SC (go Blue Hose) and a MAAE from The School of The Art Institute of Chicago. You'll find bright, gauzy floral washes, simple depictions of interiors and collages. Heavy in color and pattern, while still playful and loose, Kate's paintings are instantly accessible giving off a nice warm glow. Kate works primarily in watercolor, gouache and acrylic on Arches paper and heavily gessoed canvas. She often plays around with colored pencils, ink, oil pastels, oil sticks and Copic markers. 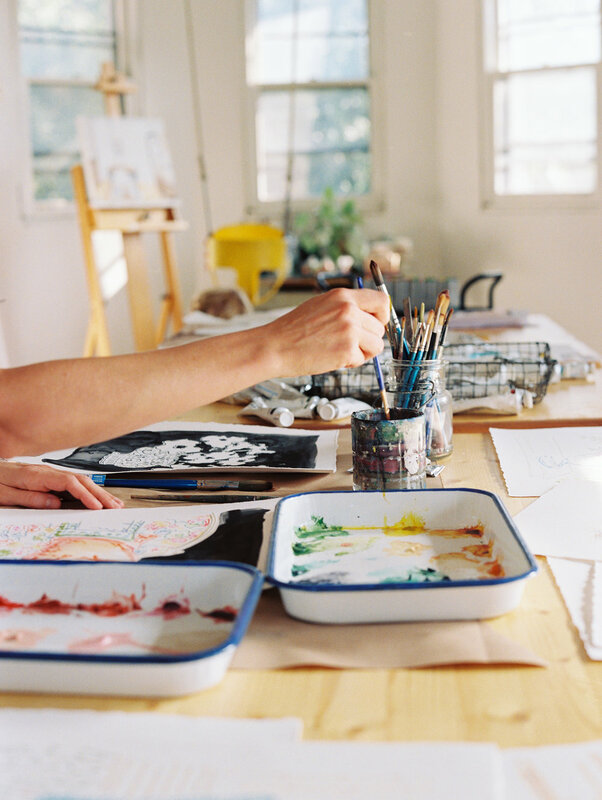 Here, you will find original, one-of-a-kind works of art created by Kate with her own hands in her studio. All original artwork is shipped directly from her studio in Chicago. Also, Kate has an array of prints available here, Artfully Walls and One Kings Lane.